World Stroke Day is October 29. Worldwide, 15 million people suffer a stroke each year. Effective stroke care requires fast action. Aspirus Riverview Hospital in Wisconsin Rapids was recently recognized for achieving the fastest door-to-imaging time of two minutes for stroke patients for the second quarter of 2018 by the Wisconsin Coverdell Stroke Program. The national benchmark of door-to-imaging, based on the American Heart and American Stroke Association, is 25 minutes. Aspirus Riverview shares this honor with just one other of the 48 Wisconsin champion hospitals participating in the Wisconsin Coverdell Stroke Program. The Stroke Team at Aspirus Riverview Hospital was formed in January 2015 and has worked diligently to develop care protocols and processes to improve care for acute stroke patients. Our team of experts utilized the Lean Six Sigma ™ methodology to streamline how care is delivered with the goal to increase efficiency and expedite treatment. These efforts have led to Aspirus Riverview Hospital’s achievement of a two-minute door-to-imaging time. Door-to-needle (DTN) is a key factor in achieving optimal outcomes for stroke survival. Coverdell Learning Collaborative conducts a performance improvement initiative focused on DTN. Metrics are analyzed quarterly for the various processes and evidence-based practices involved in achieving a rapid DTN. For the second quarter of 2018, the group examined arrival-to-CT completion times. This summer, Aspirus Wausau Hospital achieved Primary Stroke Center Certification. The strong partnership between Aspirus Riverview Hospital and Aspirus Wausau Hospital is ensuring that the residents of our area receive stroke identification and treatment that is recognized as among the best in the state. 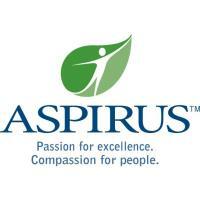 Aspirus Riverview Hospital & Clinics is a non-profit, community-directed health care organization based in Wisconsin Rapids. Aspirus Riverview Hospital is one of the top 100 community and rural hospitals in the country, and Aspirus was recently named one of the top 15 health care systems in the nation. Aspirus Riverview Hospital & Clinics employs approximately 875 people and includes Aspirus Riverview Hospital, Aspirus Doctors Clinic & Walk-In Care, Aspirus Riverview Clinics in Wisconsin Rapids, Nekoosa and Rome, Aspirus Heart & Vascular, Aspirus UW Cancer Center, Aspirus Riverview Wound & Hyperbarics, Aspirus Riverview Joint Center, Aspirus Riverview Therapies, Aspirus Riverview Behavioral Health and Aspirus Riverview Dental. In 2001, Congress charged the Centers for Disease Control and Prevention (CDC) with implementing state-based registries that measure, track, and improve the delivery and quality of stroke care. The established registry was named the Paul Coverdell National Acute Stroke Registry (PCNASR) after the late U.S. Senator who suffered a fatal stroke in 2000 while serving in Congress. In 2012 and 2015, the Wisconsin Department of Health services (DHS) became one of the states funded to participate in PCNASR. The focus of this funding is to demonstrate improvement across Stroke Systems of Care – from EMS response to inpatient care, secondary prevention, and rehabilitation post‐stroke – by linking and monitoring patient‐level data across the continuum of care. The Wisconsin Coverdell Stroke Program at the Wisconsin Department of Health Services and MetaStar will assist hospitals and EMS providers in their mission to provide high-quality stroke care by supporting quality improvement and continuing education for stroke teams and EMS professionals. Photo: Aspirus Riverview Hospital staff and local emergency services personnel recently accepted the award for fastest door-to-imaging time for stroke patients (two minutes) for the second quarter of 2018 from the Wisconsin Coverdell Stroke Program.